In a world blessed with far more than enough resources to feed all of our human family, there’s no reason for even one child to go to bed hungry. Yet, we know that almost 20,000 children die every day from hunger and hunger-related illnesses. 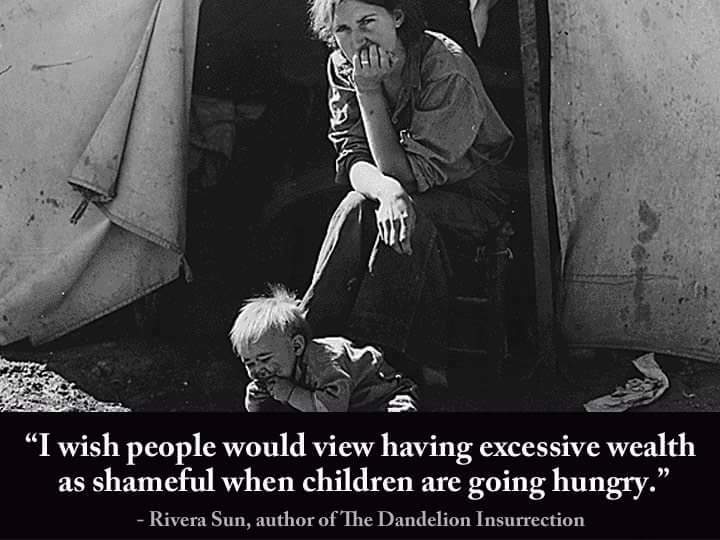 I totally agree with Rivera Sun’s thoughts on the shamefulness of excessive wealth in a world where children are allowed/are forced to die of hunger. Those with excessive wealth are complicit in those children’s deaths. No one needs to die from hunger. We have the resources to prevent hunger. All that is required is basic morality, compassion and a sense of justice. Sadly, all three appear to be lacking among most of the excessively rich. Maybe that’s why Jesus said that it was so difficult for the wealthy to inherit the Kingdom of God. What do you think? This entry was posted in Hunger & Poverty, Quotes and tagged anger, children, hunger, Jesus, poverty, priorities, quotes, reality, riches, Rivera Sun, shame, the Dandelion Insurrection, wealth, wish on October 10, 2016 by Ray Buchanan.